I found this assignment to be a bit difficult. One commonality that I noticed amongst all of us was that many of us used ‘Social Media’ as a staring point, including myself. What changed was that some students chose links that stayed in the same theme as Social Media, and others chose links that went completely off topic. I managed to draw a connection between Hannah’s and Jerrit’s trail. Hannah’s trail went on somewhat of a political path, where she evidently ended up on Donald Trump’s website. Jerrit’s trail lead him to a link about Nancy Grace who tends to talk about politics and various pop culture events. These two things stood out to me as similarities between both trials. 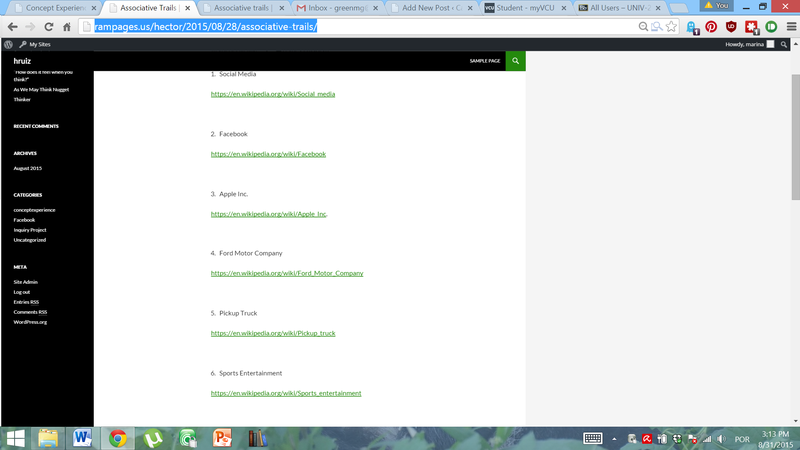 This entry was posted in associative trails, concept experience on September 16, 2015 by nadia univ 200.
) about problematic issues associated with Donald Trump. I’m an African American male and these potential allegations, some good and bad are not in my favor. I think this is why I was particularly drawn to her relatable post. Hannah expressed the same frustrations I’ve felt when encountering bigotry, ‘I felt like my IQ was dropping.'(Vestor). 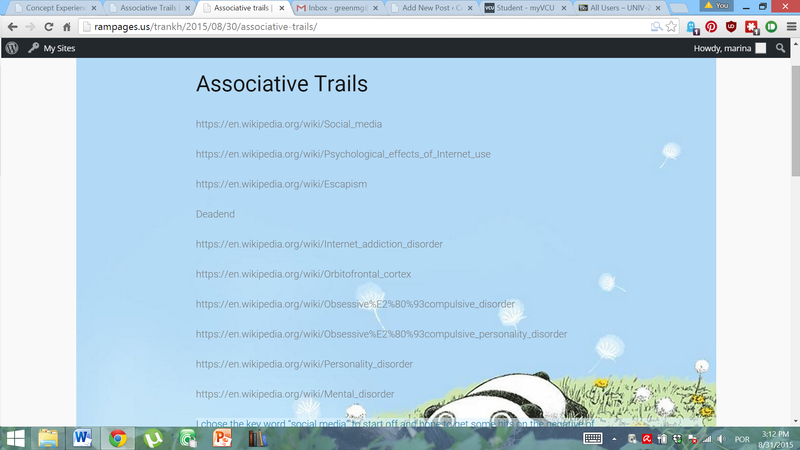 Next, I explored Hosna’s associative trails post, very interesting. Hosna’s exquisitely mapped his randomness ‘since it starts with digital media and ends with the FDC.'(hosna). Something I experienced as well, initially with digital media, intermediately with Ted Bundy(sicko) and finally at fire worship. This entry was posted in associative trails, conceptexp3, conceptexperience and tagged #think on September 2, 2015 by ajerrit. After looking through and reading everyone’s blog post on Associative Trails, I found that my post was similar to Insight,Opinions,Me…. We both start off with social or digital media and then we searched and chose our links by clicking on what we had the most interest in. For example after starting off with digital media she clicked on different interest like Avatar, Trojan War, and Helen of Troy. She has a passion for history which is what determined the links she chose. Its similar to mine because even though I started off with social media, I clicked on things like Apple Inc, Ford Motor Company, trucks, and then several topics relating to sports because even though I do enjoy social media and things relating to technology, I also have a passion for sports. I found similarities in kdurante and hosna’s posts because they both also start off with digital and social media. Not only are they similar because they chose topics that interests them; they both ended with topics that deal with the career or future they plan to work with. kdurante ended with dentistry and she plans to do something in that field. Hosna plans to join the Peace Corps, and as stated in her post the topics she chose like FDC and refugees have something to do with what she plans to do in the future. This entry was posted in associative trails, conceptexperience on September 1, 2015 by hruiz. It was a bit difficult for me to find connections with two of my peers’ blogs. After some time and going through numerous blogs, some even twice, I was able to find two blogs that I shared something in common with. 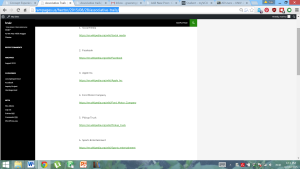 In my Associative Trails post, most of my links related to what I wanted to do with my life career wise. I stumbled upon clean drinking water, refugees and the FDC which all relates to what I want to do in the Peace Corps after graduation. . Lauramarie and kdurante did the same. After looking closely at both of their Associative Trail posts, I noticed that they both also chose links that related to their career paths. Lauramarie chose links that related to law enforcement because she is a criminal justice major and Kdurante ended their search with dentistry. Just like me, they both chose links relating to their goals, aspirations and what they’re working toward. This entry was posted in associative trails, concept experience on September 1, 2015 by hosna. I choose Jaffeywang’s blog and Insight, Opinions, Me’s blog for this assignment. Their associative trails and reflections suggest that one is driven by her predetermined topic while the other is “free spirit”, who went with the flow. With such distinct motive, even though they both started off with very similar key words, their final hits ended up way different than the other. As Jaffey is more focused on security issues of the social media, the author of Insight, Opinions, Me’s blog is more passion in history. However, they both share interest on the virtuality (virtual community, virtual self) at first before their paths started to split up. This entry was posted in associative trails, conceptexperience on August 31, 2015 by ^(oo)^. After browsing and reading my peer’s blogs I found that Insight, Opinions, Me… , Kdurante and I had similar ideas about the similar subject/matter. In Insight’s Opinions and Me I can relate to her snapchat obsession (having one as well). I can also relate to her associative trail because she clicked on links such as Helen of Troy and the Trojan War and for one of my last links I clicked on The Enlightenment Era, and so we both really looked into events that you wouldn’t associate with social media. I can relate to Katelyn Durante’s blog because for her associative trail we both stumbled upon our respective majors, so it was neat to see that someone else also happened to click on links that led to a major interest. This entry was posted in associative trails, concept experience on August 31, 2015 by lauramarie. These two bloggers have started their search with “social media” but what they found during it ended up being completely different. Hector‘s search had several links related to entertainment: football, soccer, pickup trucks, and Facebook. On the other hand, Khanh’s trail focused on more serious topics like internet addiction, personality disorders and mental disorders. Notice I say “focused” because this author meant to make her search about the negative side of social media from the beginning, as she mentions on her post. These connections stood out to me because I love social media but I really need to stop reaching for my phone all the time. The “Fear of Missing Out” is real. And I notice this behavior on others around me all the time as well. How did we survive without knowing what everyone is up to at all times? And, most importantly, do we really need to? Sure, social media can be a great source of entertainment, just like sports are. But we can also become addicted to it and lose focus of what really matters, like paying attention to your family and friends who are sitting next to you (and not to your middle school acquaintance who just posted a great pic on Instagram). 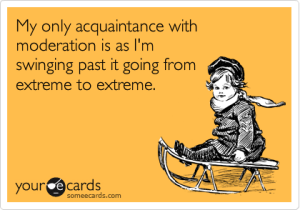 As with anything in life, social media should be used in moderation. This entry was posted in associative trails, concept experience, conceptexperience on August 31, 2015 by marina. After searching through numerous blogs, I found two blogs that share similar thoughts. Lauramarie and kdurante share similar interests. I looked very closely at their associative trails post where I noticed through their links for the blog post, they both chose links that related to their majors or the field they want to work in. Kdurante ended their search with dentistry because she is pursuing that field and lauramarie chose links that related to law enforcement because she is a criminal justice major. In a way, that blog post was about choosing the link that caught your eye. They both chose something that related to their future career and something that is related to their passion. In all honesty, I found it relatively difficult to find connections to two peers’ blogs. Over time I found Katelyn Durante and Marina Green both love Pintrest. Both had found something they liked on Pintrest and attempted to recreate it. Katelyn loves anchors and collected shells on vacation to create a shell covered anchor. Katelyn found a candy bar (yum) on Pintrest and wanted to have on at her wedding. Being on a bride budget made her candy bar a better idea over the internet, unfortunately. She was disappointed but learned her lesson and to expect less from the real world. They both had the same perception at first, but by the end of the blog post, they thought differently from each other. 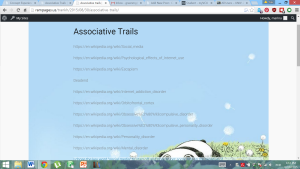 This entry was posted in associative trails, concept experience on August 31, 2015 by hannahv. I decided to connect the associative trails that belong to Hosna Shoja and Laura Gutierrez. I feel these two were similar in their ideas that they both started with a social media and then went on to stuff that was completely far off from being related to the internet. These two posts are similar to all of the other posts, but they are also different than the others. They are different than the others because these posts contain sites that lead to give more information about future career plans, whereas a lot of the other posts contain sites that were chosen purely because it was a topic that they found interesting. This entry was posted in associative trails, concept experience on August 30, 2015 by kdurante.